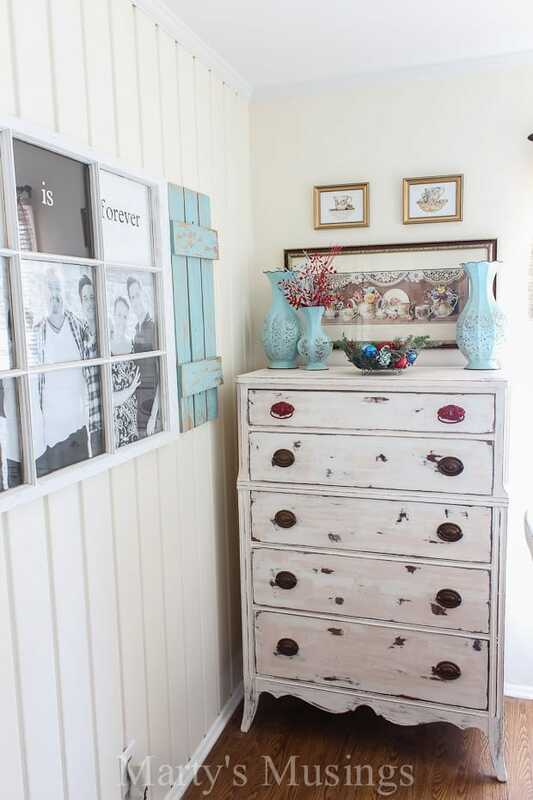 Decorating with red and aqua is a great new color combination. 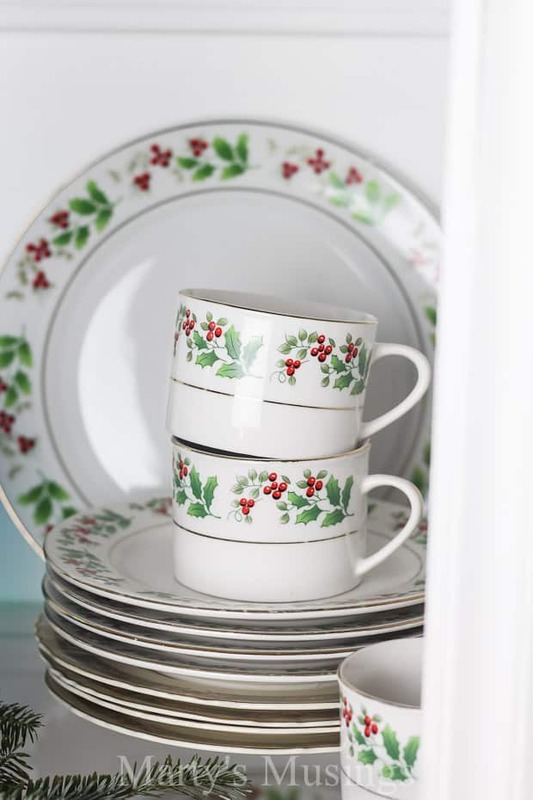 Perfect for a kitchen at Christmas with yard sale finds, natural decor and frugal decor. 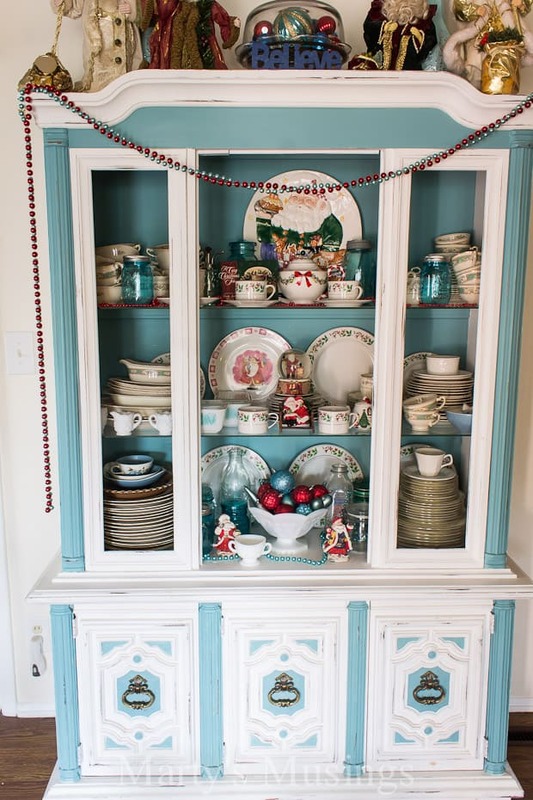 Last year I decorated with red and aqua in the kitchen at Christmas and loved it so much I decided to change the colors in the room! 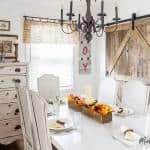 I’ve been slowly adding red into the decor and since I’ve never shown the opposite end of this room I’m hoping to do a reveal in the next few weeks. Sadly it’s about a year late but that’s about par for the course for the year 2015! I just haven’t been able to pull together the finishing touches but it’s on my to do list for January. 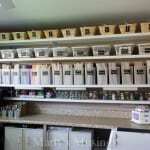 One of the changes I made was to my hutch. 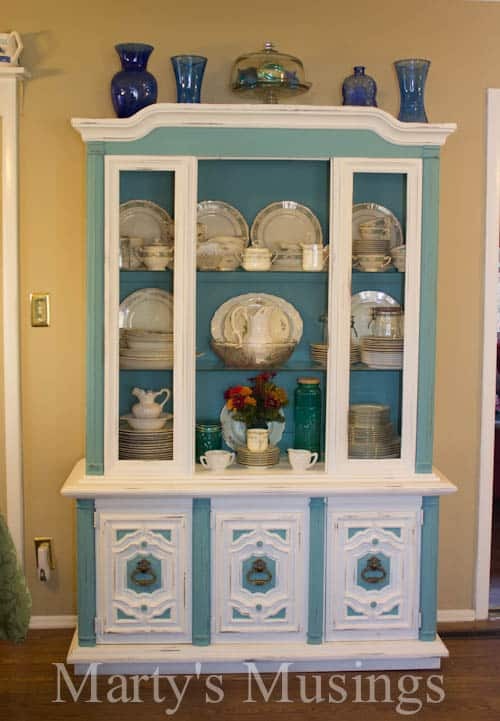 Originally a 1970’s glass china cabinet, it was our first chalk paint project. 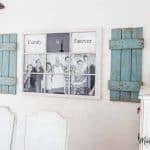 Obviously I needed some help with the styling but the difference with the chalk painting was amazing. 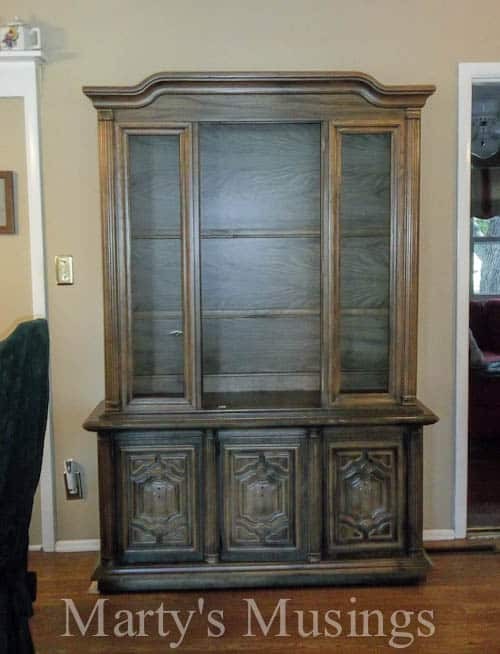 Here’s last year’s Christmas hutch. Obviously I hadn’t learned the lesson that less is more. 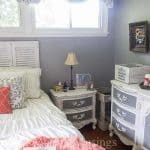 This year my DIY hubby chalk painted the inside of the cabinet white to give me a neutral background to decorate around. Such a big difference! Working from the top down I used a simple basket filled with fresh greenery from our Christmas tree lot for the top of the hutch. Much less cluttered and clean looking. 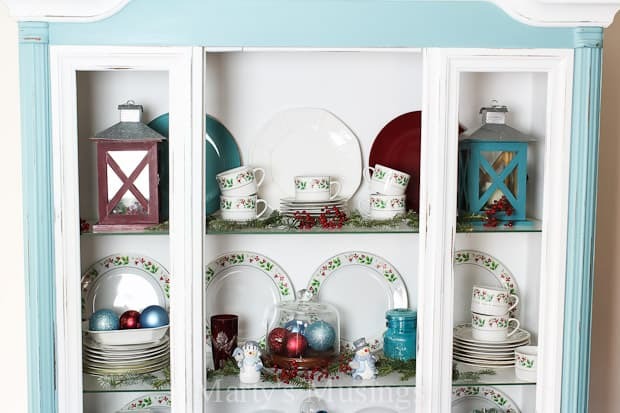 On the top two shelves I used my Christmas china mingled with some aqua and red plates and lanterns. I love this china of mine but can’t use it in the microwave because of the gold ring. 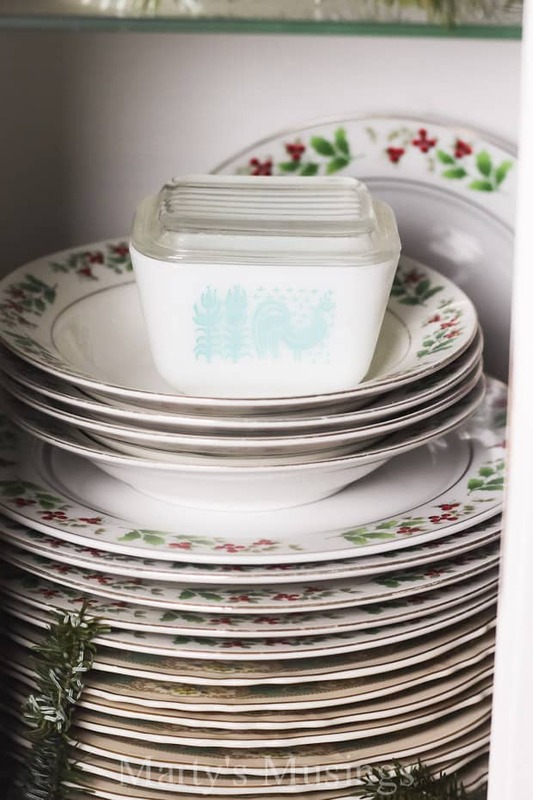 Instead I use my mom’s everyday Christmas dishes and save these for our special family dinner. 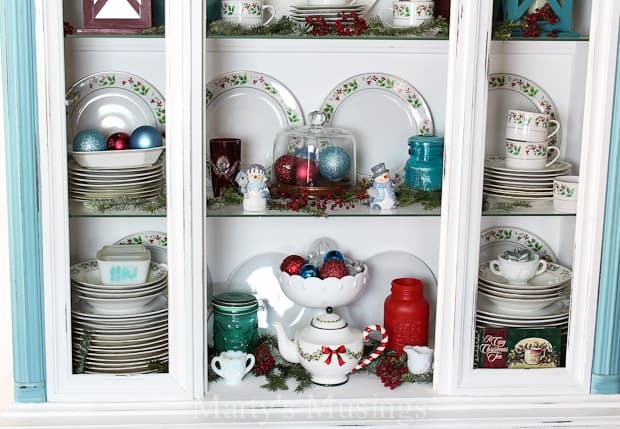 A bit of greenery and red berries on the glass shelves bring out the colors in my china. 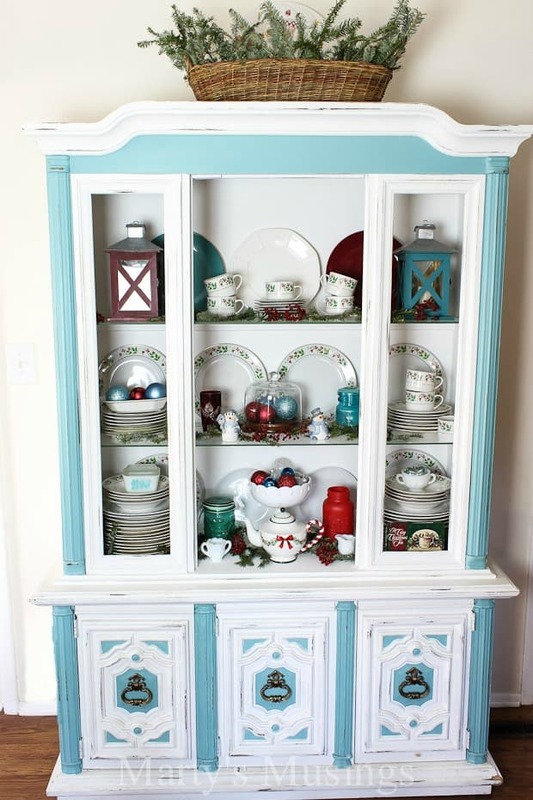 The bottom two shelves are filled with red and aqua ornaments and white accents pieces. 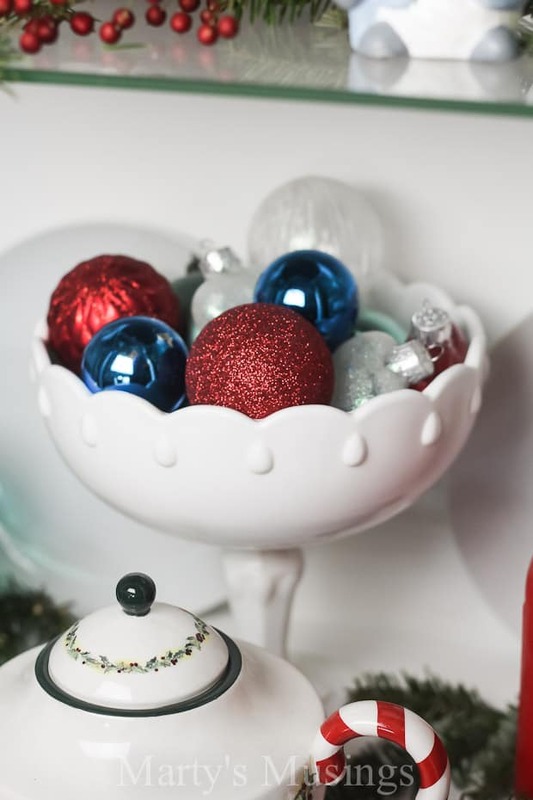 My vintage white milk glass pedestal compote dish is filled with sparkly ornaments. 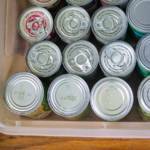 So easy and inexpensive! 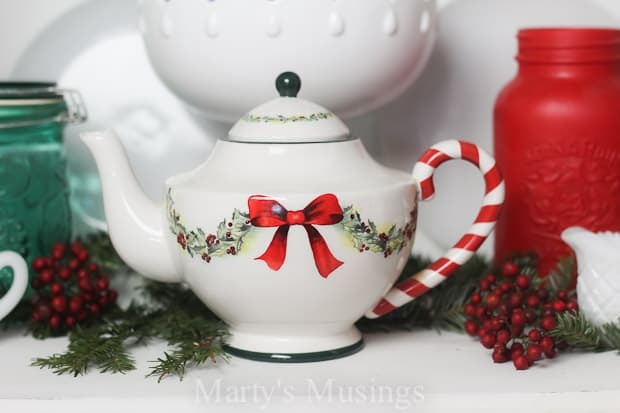 This Christmas teapot was a gift and shares a shelf with a painted mason jar. 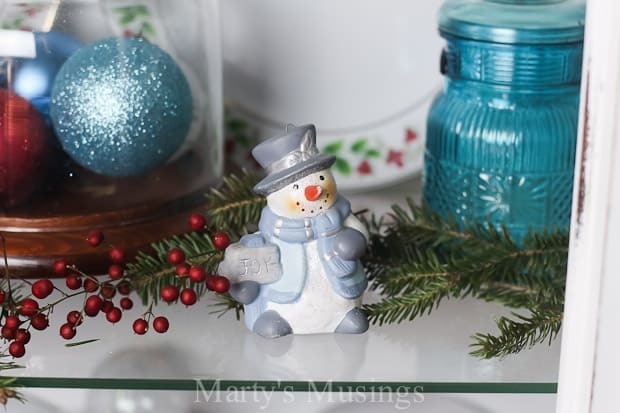 A dollar store snowman fits right in among the natural greenery. 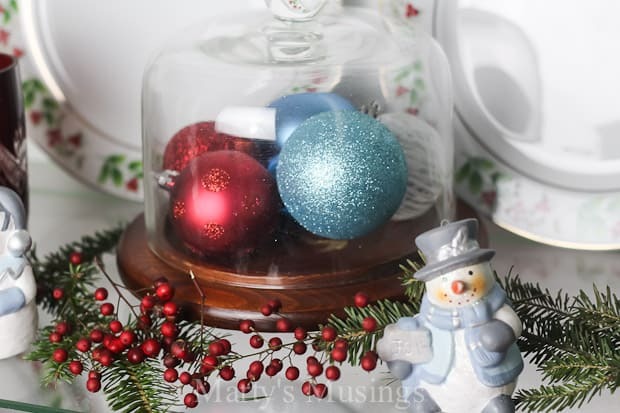 This mini cake plate is quite versatile and used for the holiday season with more of these inexpensive ornaments collected on sale at the end of the season. 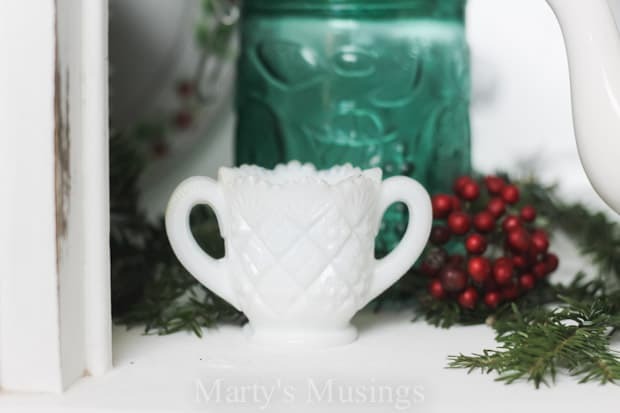 Another vintage milk glass favorite is this little sugar bowl hiding in the corner to add just the right touch of uniqueness to the decor. So many of my accessories are yard sale treasures, including this mini vintage pyrex baking dish. So adorable! 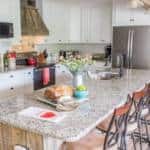 At this same end of my kitchen is our table and my trash to treasure dresser. 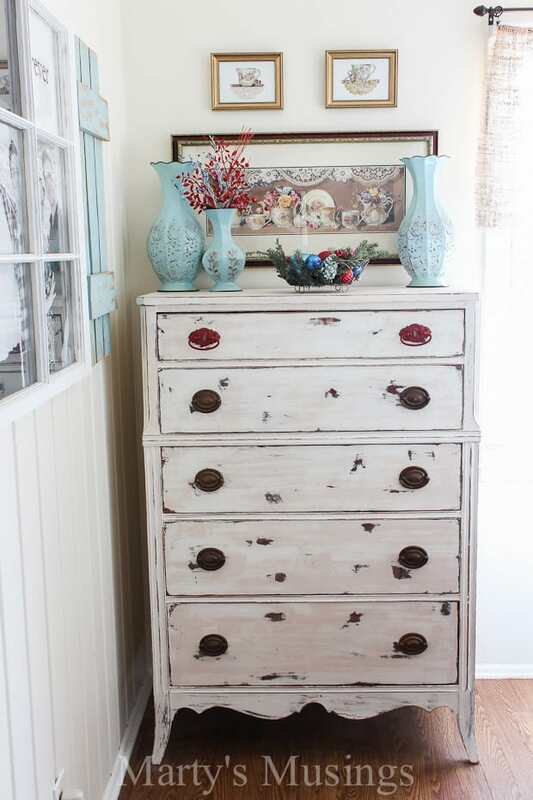 This piece of furniture just makes me happy and the simplicity of the decorations is perfect. The vases were yard sale purchases for $1 each, the metal basket also $1 and filled with greenery and more ornaments. 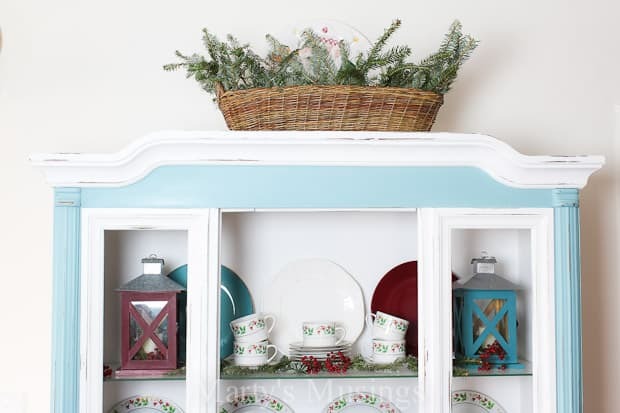 A few sprigs of red and aqua sparkly floral stems and this little vignette is done. Now you’ve seen my kitchen all decked out for the holidays! I have a bunch more pictures of my home to share with you before Christmas so hopefully in the next couple of days they’ll be ready! 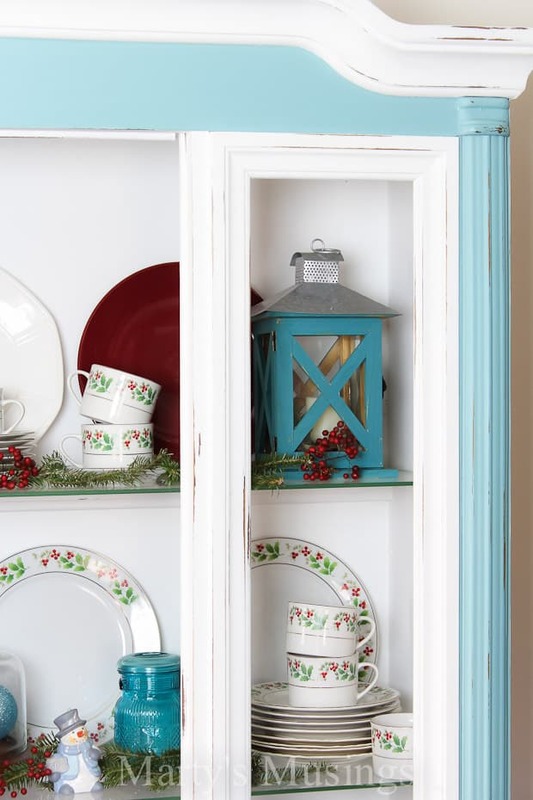 What are your favorite colors for Christmas decorating? Love this color combo Marty and the red makes it pop. Love it!! Turquoise and red combo is my favorite!! You did an amazing job!! Love all the yard treasures you found 🙂 Hope you have a very Merry Christmas! !